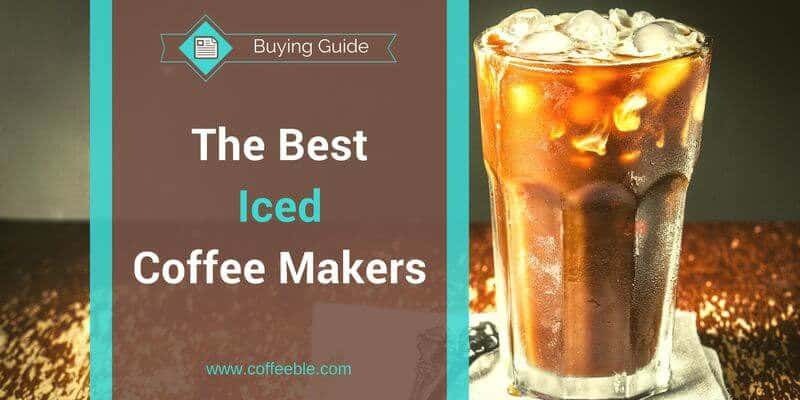 If you are wondering how to make iced coffee at home and don’t want to spend a lot of money at the well-known chains you are at the right place. Would it not be nice to have a mouth-watering Caramel Frappe waiting for you while bathing in the sun. Or do you prefer just a simple iced coffee with no flavor at all? You can do it all at home and I’m here to help! With either the tools you already have or by purchasing a special coffee maker that is designed for iced drinks, you are all set. Keep reading and I will provide you with some information about how to do some magic with coffee and ice and what different options you have. Additionally I have picked a few iced coffee makers and looked closely at them to see if I can recommend them to you with a clear conscience. 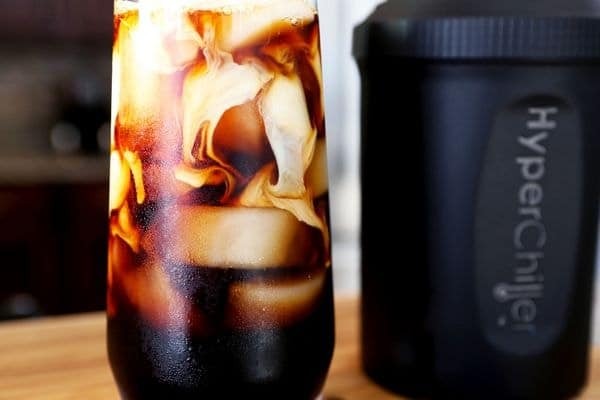 Before we start I have to make something clear: you will not really get a delicious iced coffee drink with brewing some Java and then throwing in some ice cubes. I’m guilty – I did that. But I didn’t know it any better. The ice immediately melts and weakens the great flavor of your coffee. Here’s the thing with iced coffee: you always need more coffee than you usually use with your hot coffee, but when you try to get a good cup of Joe the way described above you have to use even more. And when you think about it, this is counterproductive. It’s like you brew your hot coffee with way too many grounds and because it’s too strong you dilute it with water afterward to make it weaker. Why should you do that? Exactly! The brew temperature of coffee is around 200° F.
Even if you place your hot cup in the freezer it would take several minutes until it is cooled off enough so that ice cubes won't just melt and dilute your coffee. What you need is a mini freezer just for your coffee. The HyperChiller consists of two stainless steel tubes and an empty chamber in between with just enough space for your coffee to cool off within seconds! And the best: it never touches ice. If you want more information read my full review about the Hyperchiller here. You may already have this small kitchen helper in your drawers without being aware of its diversity. I'm talking about the Pro Quality Nut ﻿﻿Milk Bag. These bags are made of a fine nylon mesh and can be used to make cheese, almond milk or – surprise – iced coffee. Now, what is left is ground coffee and fresh water. I recommend a coarser ground of coffee to have the least amount of sediments in your cup. I recommend doubling the amount of coffee you normally use for your morning brew if you experience a too weak flavor. Fill the Nut Milk Bag up with coffee, pull the string and put it in a large pot. Add cold water and place the pot in the refrigerator. The next day you remove the bag, squeeze it out if you want and optionally run the brew through a paper filter into another pot to remove the rest of sediments. Now just add some ice and milk or additional flavor and you have a delicious iced coffee made at home! 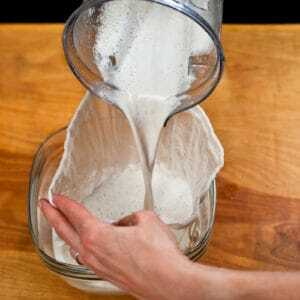 The Pro Quality Nut Milk B﻿ags are reusable and last for a long time. Just wash them in water with a little soap and they are ready to be used over and over again. 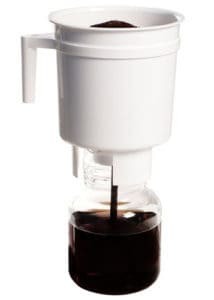 The next fancier step to the Nut Milk Bag is a Cold Brew Coffee Pot like the Toddy T2N or Hario Water Brew Coffee Pot. Let’s have a look at our two nominees. An easy and cheap way for a delicious cup of iced coffee is to get the Hario Water Brew Coffee Pot. And the preparation is very simple. Fill up the 34 ounces water beaker with fresh cold water. But not too much otherwise it will spill when you add the filter. Then pour ground coffee in the filter. If you are wondering how much coffee you should use, it depends on if you want a stronger or weaker brew. For a bold coffee fill the filter up to the top and use less the next time if it was too strong. Wait 12-24 hours and your coffee is ready. I have read at Amazon Reviews that some people complained about how messy it is to clean the filter. But I have to disagree! Cleaning is super easy because the filter is so fine that nothing will get stuck in between. All I had to do is rinse it with warm water and it was good to go for a new batch. This patented cold brew system from Toddy works similar to the just described Hario Coffee Pot. However, the pot is with 56 fluid ounces almost double the size of the Hario. While the steeping process is the same the preparation is a little bit different. At first you have to place one of the two reusable filters in the dedicated spot at the bottom of the pot. Don’t forget to plug in the rubber stopper at the bottom, otherwise you will have a big mess when you pour the water in. Now you add half of the ground coffee, covering it with some water, add the rest of the coffee and at last pour the remaining water over the coffee grounds. According to Toddy, it is not recommended to stir the coffee, just push the grounds under water. Otherwise, the filter could clog. As with the Hario, wait 12-24 hours before you carefully remove the rubber stopper and watch the glass beaker filling up with the coffee. Since you have a more bucket-shaped container with a smooth surface, cleaning is compared to the Hario a breeze. Hario Cold Brew Coffee Pot or Toddy Cold Brew Coffee Maker? The Hario has 34 fluid ounces and the Toddy 56 which means with the Hario you get about 6 cups of coffee and with the Toddy about 9 cups. So if you have guests or want to keep it longer in the refrigerator, go for the Toddy, otherwise the Hario is just fine. The Toddy is easier to clean, but you have two additional items, the filter, and the rubber stopper. The Hario, on the other hand, is much cheaper than the Toddy. So it’s up to you if you prefer convenience over price because the taste of the coffee is with both delicious! Well, the Mr. Coffee BVMC-FM Frappe Maker is not really a drip coffee maker per se. It is more a hybrid between a coffee machine and a blender. Before you brew the coffee like with any other traditional drip coffee maker you add ice cubes, milk and other ingredients like sugar or syrup in the blender. Turn the machine on and push the Frappe button. 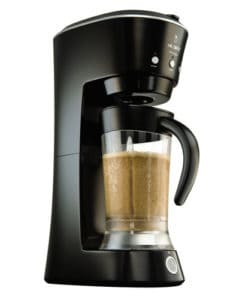 After the brewing cycle is finished the Mr. Coffee Frappe Maker automatically starts with the blending process. And voila – your iced ‘whatever ingredient you added’ frappe is ready to serve. The Mr. Coffee BVMC-FM Frappe Maker is without a doubt the most convenient way to get an iced coffee or frappe whenever you crave for an iced coffee drink. However, considering the price it is also the most expensive one and the flavor of the coffee is compared to the Hario or Toddy weaker. So go for the Mr. Coffee Frappe Maker for convenience and choose the Hario Cold Brew Coffee Pot or the Toddy Cold Brew System for the perfect taste! Tell me, how do you make iced coffee?